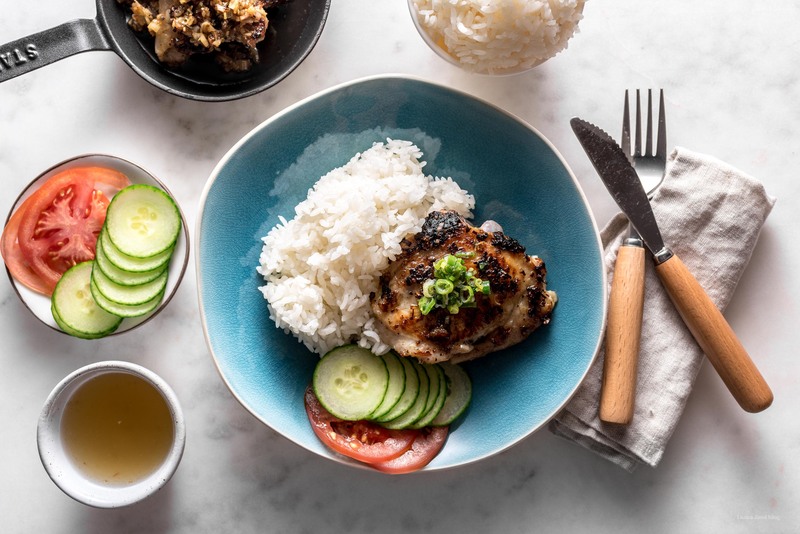 This lemongrass chicken is all about maximum flavor from minimum effort. One of my favorite dinners! Lemongrass chicken is the bomb. Super flavorful and perfect with rice and a side salad. I always tell myself I’m going to order the lemongrass chicken plate when we go out for Vietnamese food, but inevitably, I order pho because making lemongrass chicken at home is so easy. The most time consuming part, aside from waiting for the chicken to marinate, is cutting up the lemongrass. You need a sharp knife, but really, the trick is that you only want the tender, white inside part of the stalk. The best way to do this is: trim off the root and essentially all of the green tops. Peel off one or two of the outer layers. These are woody and tough. You can save all your trimmings to simmer with your favorite stock/soup recipes. After all that is done, you should have a nice, pale stalk. Use your knife to carefully cut down the stalk lengthwise so you have two half-moon shaped pieces. Now you have a flat side to place against your cutting board and from there you just mince along the length of the lemongrass. If you have a bunch of time on your hands and a bunch of lemongrass, you can mince it and freeze it in small portions. I love having minced lemongrass in the freezer – such a time saver. 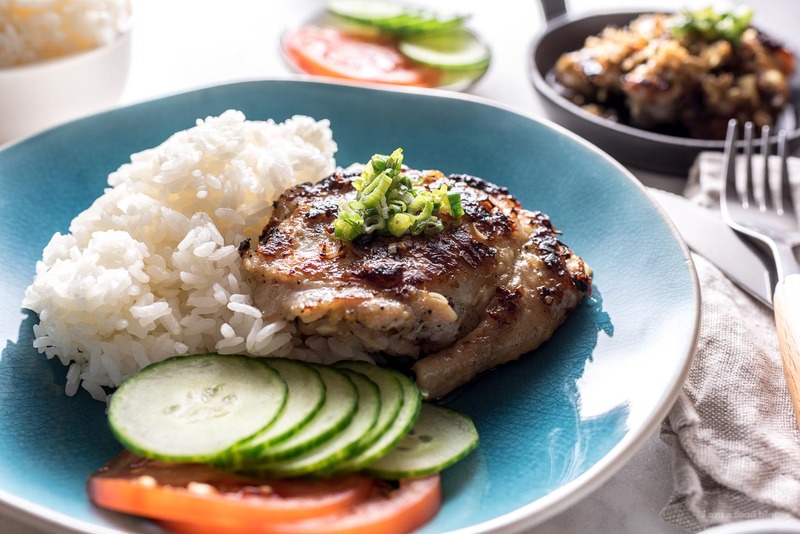 Speaking of freezing, you can also marinate a bunch of chicken in this lemongrass marinade and freeze it too! In a shallow bowl (of if you prefer, a ziplock bag), mix together the minced lemongrass, shallot, garlic, sugar, fish sauce, and black pepper. Add the chicken thighs and coat with the marinade, making sure the thighs are completely coated. Marinate for an hour or overnight. 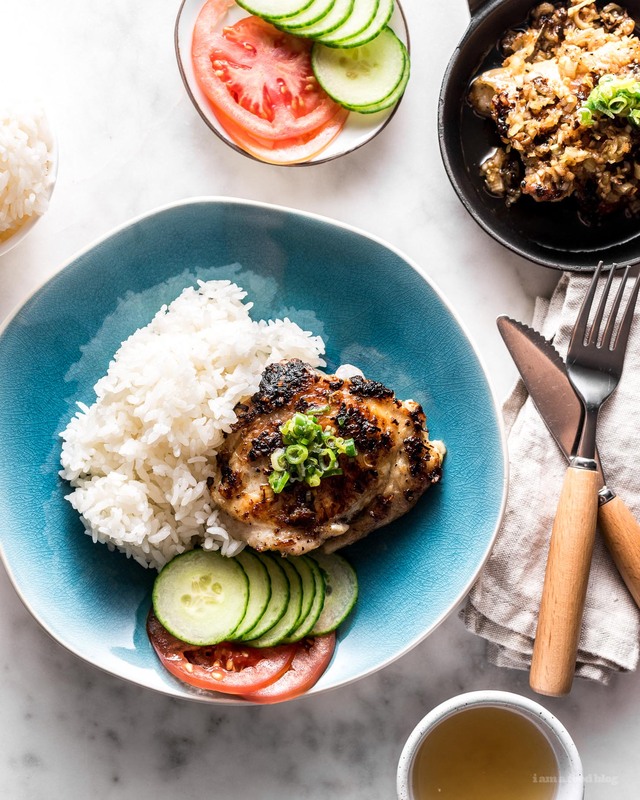 When ready to cook, cook your rice according to your favorite method so it’s ready to eat when you’re done cooking the chicken. Heat up a bit of oil in a heavy-bottomed pan and cook the chicken, skin side down, over medium-heat until the skin is brown and crispy, about 15-20 minutes. Flip and cook the other side for 5 minutes and check near the bone to make sure the chicken is cooked through. The total time should be about 25 minutes, depending on size. Serve with fluffy rice and tomatoes and lettuce, if desired. Enjoy! 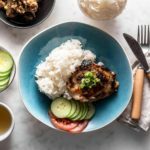 Notes: You can use boneless, skin on chicken thighs too, they’ll cook a bit faster. Lemon grass is not available in my area but I can get it in a tube. I think it will work I just need an idea as to how much I need. This looks amazing! Do you think grilling the chicken thighs would be a good option? you can absolutely grill them! This simply making my mouth water. And needless to say about the vibrant colors in the images makes the recipe more lively, appealing and happening! This looks great! Question- in the photo of the fish it looks like there is a bowl of dipping sauce. If it is, would you mind sharing what it is? Thanks!